All meals are prepared over the fire. 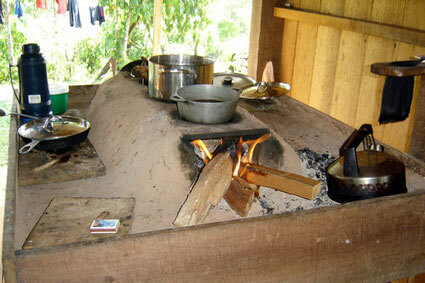 The stove is built on a table. It consists of stones, which form a «U»-shape are covered with ash. A plate of steel that contains some holes for the pans is put on the stones. The fire is made with wood, which requires an experienced hand, so that the meal does not burn. The main food has changed from corn to rice. Nevertheless, corn still is an important component on the food plan. But these days more rice and Frijoles (Indian beans) are cultivated and used. The Guaymies also know different tuber fruits, which are similar to our potatoes. The jungle supplies them with palmito (the marrow of a palm tree) and the point of a specific fern can be eaten as well. On family Carrera’s ground there are also many fruit trees; for example mandarins, oranges, litchis, water apples or mangos. Bananas, cooked or uncooked, are a good alternative on the food plan, too. We love to spoil our guests with all these delicious food varieties.